You want perfection, go to a bowling alley! I don't want to scare them. I don't want their heads spinning. Administrations win championships. Not coaches. They think they're supposed to win. I second the motion. His record is spotless. He graduates every kid. He doesn't look at other women. He doesn't smoke. A great defensive effort. The one thing we have to do is make it hard for people to beat us. We're not worried about winning and losing, we just have to make the game hard. Those guys on TV and radio have to come up with some opinions and some upsets. We're deep and we're also fast. I want the game that way. I like it. It's stimulated by thinking. I thought it was the best way to utilize these players. So I changed. People thought I was crazy. 'You've won all these games doing it one way, all of a sudden you're changing everything. Go ball. Go ball. I'll worry about the coaching. You just get out there and ball. New Updates! (4/23/2019) We've been working really hard on completing our membership system so you can submit quotes and keep track of them. Once this is complete in the coming weeks there will be a lot more quotes by John Calipari and other authors. 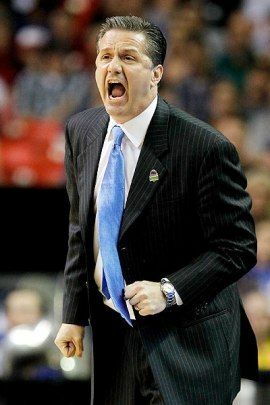 We've also changed the sorting on the site so you now see the latest John Calipari quotes first. Our goal is to have the best John Calipari quotes on the web!